Completed in 2009, the steel hull MY Andromeda is almost 40 metres long with a sleek, stable design and high-quality interior. 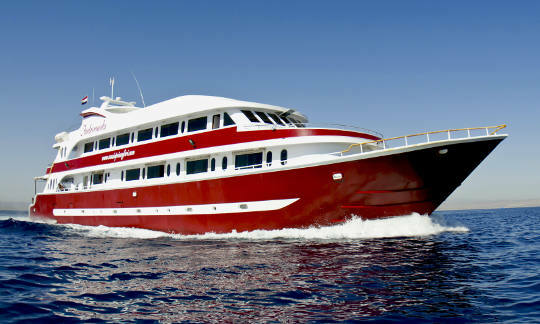 Accommodating up to 26 guests, she runs 7 and 14 night Red Sea diving cruises to the best sites in Sudan as well as Egypt. This new boat is the sister to the MY Cassiopeia and is another first-rate custom-built Egypt liveaboard. All 13 air-conditioned twin/double cabins are spacious and elegantly furnished and have en-suite facilities. You can expect high quality throughout the boat and there are plenty of communal areas to relax between dives. 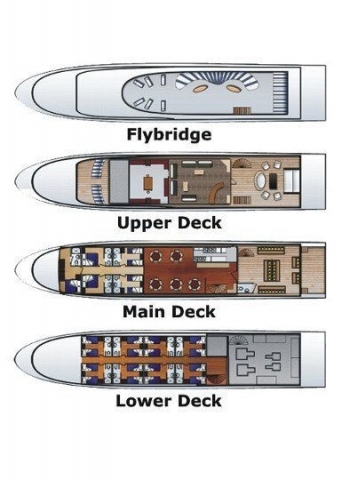 There is an upper sun deck and shaded area with sun beds and cushions, and there is a lounge area in front of the air-conditioned saloon that provides great views. Internet is provided free of charge on the boat. 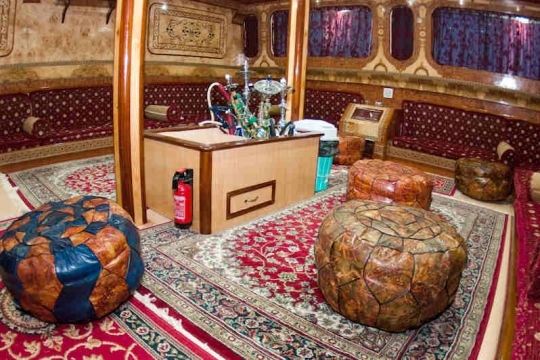 An extra delight is the Shisha room: decorated like a traditional Arabian café. Here you can enjoy a hot drink and indulge in original Egyptian Shisha tobacco. Oriental music playing in the background adds to the authentic atmosphere for a memorable experience. The large dive deck means kitting-up is made easy. There is plenty of room for storing your scuba gear and camera rinse tanks and storage space are provided too. 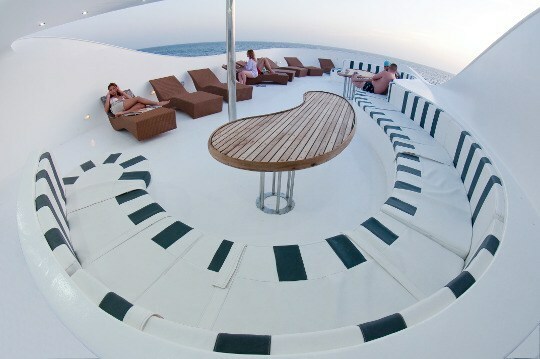 The deck is huge and specifically designed to accommodate groups of scuba divers entering the water at the same time. Andromeda provides diver locator devices for each buddy team to improve in-water guest safety. 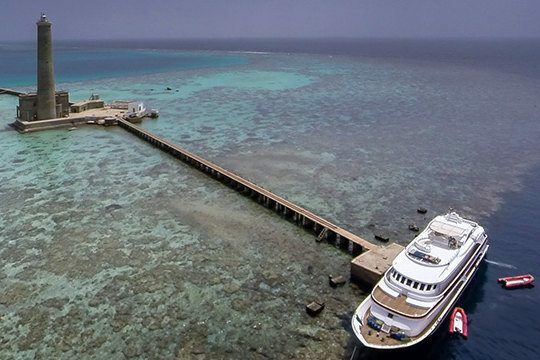 If you are looking for a top-quality liveaboard and excellent service while you cruise the Red Sea, whether it's in Sudan or Egypt, the MY Andromeda is a great choice. Departures are on Sundays. Notes: Diving experience required: for North & Wrecks safaris - Open Water diver license and 20 logged dives; for St. John's Reefs safaris & North Sudan - Open Water diver license and 30 logged dives; for Brothers, Daedalus Reef & Elphinstone safaris & South Sudan, Deep South Sudan - Advanced Open Water diver license and 50 logged dives. Cruise price per person includes: Cabin accommodation with air-conditioning, breakfast, lunch, dinner, snacks, water, soft drinks, hot drinks, dives (as detailed in the trips above), experienced English-speaking divemaster(s) (max 13 divers per DM), tanks, weights and weightbelts, personal EPIRB, internet Wi-Fi, shisha (tobacco smoked through a water-pipe), boat permissions and taxes. 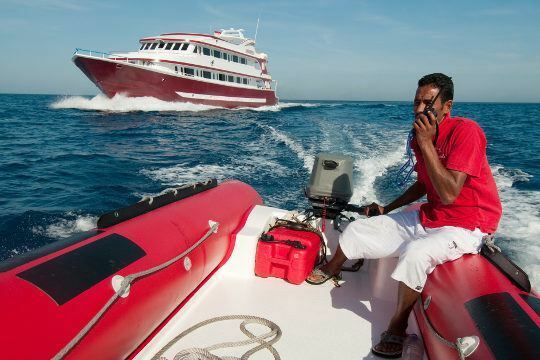 Brothers, Daedalus, Rocky and Zabargad: US$ 45 per person per island per week. Ras Mohamed: US$ 11 per person per day. Sudanese fees: (for Sudan trips only) Taxes and entry visa (US$ 210 + US$ 155, or US$ 210 + US$ 225 for USA nationals). Unless otherwise stated, all the listed items need to be paid on arrival (cash only). Optional extras: Return transfers from airport/hotel to departure points, alcoholic drinks, nitrox fills for enriched air certified divers (US$ 101 per week), torches, dive computer, 15 litre tank (US$ 62 per week). Unless otherwise stated, all the listed items need to be paid on arrival. 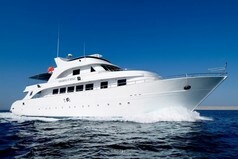 How to get there: Egypt trips: Andromeda departs from Hurghada or Port Ghalib for Egypt liveaboard trips. Transfers can be arranged at additional cost from these airports to the departure points. There are flights from Cairo to Hurghada (1 hour) with Egypt Air. From some airports in the UK and Europe it is possible to fly into Hurghada direct. For more details visit our Red Sea travel information section. Guests arrive and board on the first day. The boat leaves the harbour on the morning of the second day. Sudan trips: Andromeda departs from Port Sudan for Sudan liveaboard trips. There are flights from Cairo to Port Sudan with Egypt Air and Sudan Airways. This is a much easier route than flying into Khartoum. Included in the Sudan visa fee are return transfers from Port Sudan to the departure point. The first and last nights of the itinerary are spent in the harbour. Guests arrive and board on the first day. The boat leaves the harbour on the morning of the second day. Full tourist visas are available only at the airport for citizens of certain countries, unless obtained in advance. Please ensure you understand the tourist visa requirements that apply to you. The last dive of the trip will be at around 12:00 noon on the second last day of the trip. Please wait at least 18 hours before flying after diving. Non-diver rate: US$ 112 off the published price. Single supplement (if you do not want to share accommodation): This is optional - single travellers may choose to share a cabin or pay a supplement of 75% of the published price. Dive clubs and group discounts: None available. 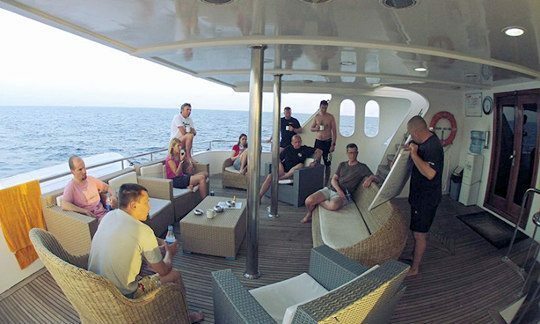 Whole boat charter rate (per night): Egypt: Low Season - US$ 3 191, High Season - US$ 3 558, Winter Season - US$ 2 732. 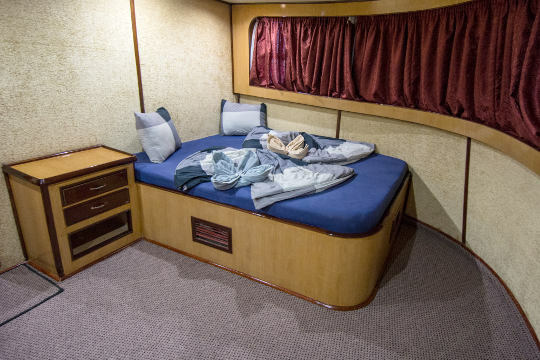 The Andromeda liveaboard accommodates 26 divers in 13 cabins. There is 1 Honeymoon cabin with a queen size bed, and 2 Queen cabins on the main deck. There are also 2 Standard twin bed cabins on the main deck. All these cabins have windows. On the lower deck there are 8 more Standard twin bed cabins, with portholes. All cabins have private en-suite bathroom facilities and a TV player. 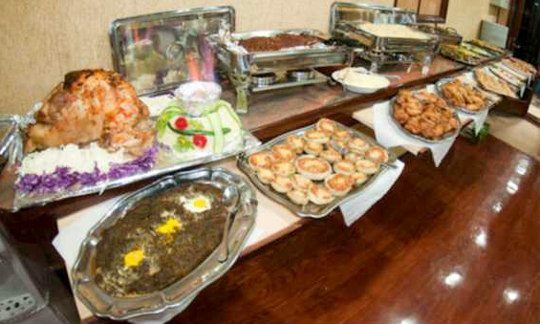 Food on this Red Sea liveaboard consists of both local and international dishes served buffet style. You can expect a large range of dishes with each sitting and a good standard of cuisine. In addition to the 4 meals a day, snacks, cookies and fruit are always available to make sure you never go hungry. International, Italian and local Egyptian cuisine are served on board. The menus are not fixed and meals are served as a buffet. 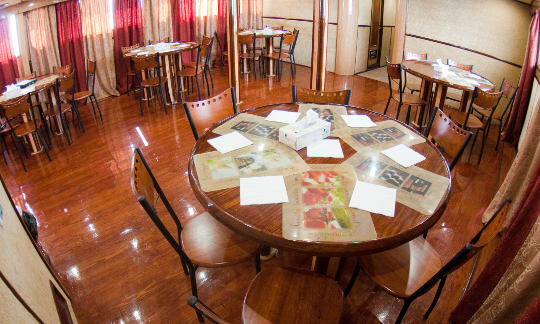 Complimentary main meals consist of pre-breakfast, breakfast, lunch and dinner. Tea & coffee, drinking water, soft drinks, fruit, biscuits, candy bars, toast are free of charge. Beer and spirits are available for purchase on board. Vegetarians are catered for on this boat. Catering begins with arrival on the first day. 12 & 15 litre aluminium & steel tanks with DIN/international fittings.